This piece was written by Wiltshire County Council Principal Archivist Claire Skinner, and appears as a blog on the Wiltshire and Swindon History Centre website here. 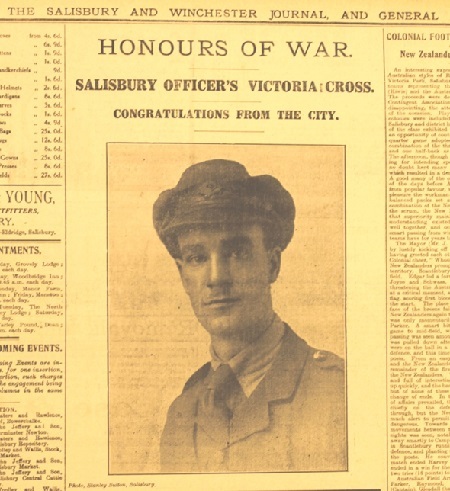 In the past I carried out some research on behalf of Salisbury City Council into Thomas Edwin Adlam, a native of Salisbury, who won the Victoria Cross in 1916. 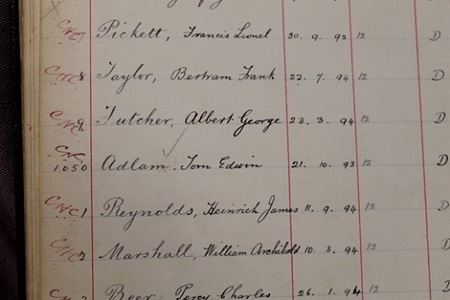 In the course of my research I uncovered a fascinating story, which I thought I would share with you, although I am sure there is a lot more still to be learned, in family papers not yet deposited at the History Centre. Tom was training to be a teacher when he joined the Territorial Force (precursor to the T.A.) in September 1912, and had only spent one month as assistant master at a Basingstoke School when war broke out, and he was mobilised. Originally stationed in India, he applied for a commission and became Second Lieutenant in the Bedfordshire Regiment in November 1915. At school he had excelled at sport, including cricket, which benefitted him in the war owing to his ability to throw bombs further than many of his peers! On 21st June he got married to Ivy Mace, a month before he arrived at the Western Front on 18 July 1916, having, fortuitously, missed the 1st Battle of the Somme on 1st July in which his battalion received heavy casualties. He received his VC for his part in the assault on the Schwaben Redoubt at Thiepval, at the end of September 1916. This well-guarded defensive position had been held by German forces for several months, and they did not give it up without a fierce and bloody fight. 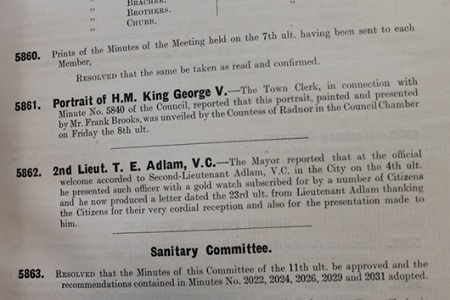 Following this it is believed Tom Adlam went into the Royal Air Force, but did not take part in active service until the Second World War, in which he rose to the rank of Lieutenant Colonel. He became headmaster of a school at Blackmoor in Hampshire where he and Ivy raised their four children. His VC and the gold watch presented to him on his return from France are now on display at Salisbury Guildhall. It is fitting that, in the commemorations of the First World War taking place until 2018, the city and county of his birth should remember him and his amazing courage.